The Chemistry department seeks to establish a sustainable fund to support professional development activities for Western chemistry and biochemistry students. Attending a scientific conference is a transformative opportunity for students. 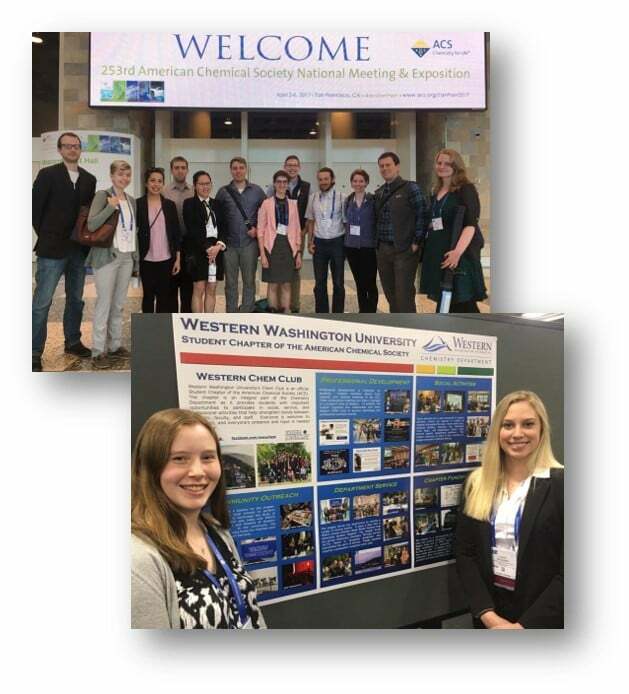 Each year the department sends over 50 students to conferences (e.g. National Meeting of the American Chemical Society and the Volcano Conference in Chemical Biology). However, due to financial constraints less than half of our majors are currently afforded this valuable educational experience. Undergraduates Attending & Presenting at Conferences. Supporting the Student Professional Development Fund will enable more students to attend regional and national conferences by providing financial support for registration fees and travel expenses. Hosting Industry Professionals to Interact with Students. In addition to conferences, the department will allocate a portion of these funds to bring industry professionals to campus to share their career experiences with students. Such events will be open to all students, and will provide opportunities for students to have personal interactions with professionals employed in various sectors in industry. Please consider giving to the fund that will enrich and more fully include all of our majors in the Western Chemistry experience. We encourage you to post and share this link with other alumni, parents, and supporters of Western Chemistry! On June 1st, WWU's 2nd Annual Western Give Day, the WWU Chemistry Faculty/Staff will match 1:1 for the first $1,000! Beyond that, a portion of EVERY gift made will be matched through the WWU Give Day Challenge Fund! Take advantage of this amazing opportunity and support WWU Chemistry students! Support to fund student registration fees and travel to conferences. Student registration fee and travel support to attend a regional conference. Student registration fee to attend a national conference. Student travel support (e.g. hotel, airfare) to attend a national conference. Support to bring industry professionals to campus to share their career experiences with students or to send multiple students to a national meeting.